We started putting our bee boxes together tonight. 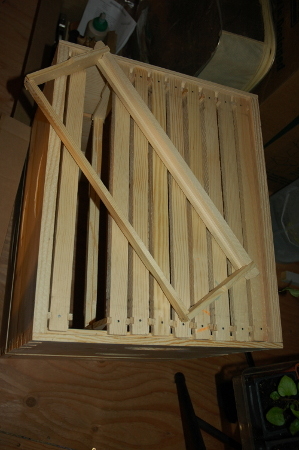 We purchased the equipment unassembled at a local beekeeping shop. In the future, we might build some of our equipment, but there’s probably not that much money to be saved either way. 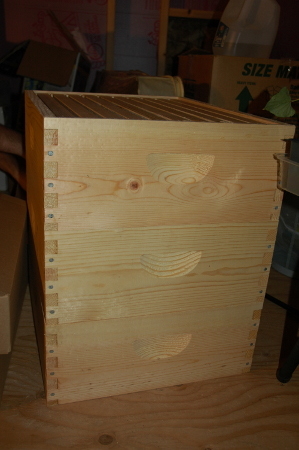 The equipment is all standard Langstroth hive equipment, although our beekeeping plans are anything but standard. Specifically, we want to keep bees with minimal interference and no chemicals. We also plan to use only wild swarms, which are often more resistant to common problems (specifically because they haven’t had humans coddling them for years). There’s a ton of information to be found online about beekeeping, so there’s no sense in me repeating it here. I would recommend starting with a basic book on bees or a guide from your local beekeeping association. Then check out Bush Bees, Backwards Beekeeper, and Bio Bees. That will clear your head of all the pharmaceutical-driven madness of “modern” beekeeping. If you want to stick with standard equipment (which is fine) Bush Bees has lots of good advice. I’m following most of the things he recommends. If you’re looking for a book on chemical-free beekeeping in standard equipment, there is only one: The Complete Idiot’s Guide to Beekeeping. I hate series books, but I bought this one because the authors are well respected. We are using all medium size super boxes. This keeps your equipment consistent, and saves your back. The boxes were assembled using food-safe waterproof glue and galvanized nails. Most people paint their equipment white, but we are leaving it bare for several reasons: 1.) lazy, 2.) lasts about as long either way, 3.) chemicals in the paint might affect the bees, 4.) painted wood doesn’t “breath” and might lead to moisture problems in the hive. We also built 10 frames, enough to fill one box. The bees draw their comb in the frames, and they are movable so you can inspect them and harvest honey. The standard procedure is to fill each frame with wax foundation (pre-molded sheets onto which the bees are supposed to draw their comb). There are a number of problems with the standard way, so instead we are going to make some wedge-shaped guides that glue into the frames. When we get those done, assemble the bottom, and build a stand and lid we will be ready to capture our first swarm. Ouch!! Almost there! Yeah! Can’t wait to read about your capture of the swarm! Sounds painful! I’m very interested in the decision to catch a wild swarm. Even more interesting will be how it goes. I’ve been leaning toward top bar hives, for the same reason, i.e. less invasive, natural beekeeping. Unfortunately, our county beekeeping club is strictly “modern” in terms of using routine pharmaceuticals. I was familiar with the Barefoot Beekeeping site but not the other two, so thanks for the links. I have not ventured into this yet, very interesting. Lynn – Robin has an uncle who lets honeybees live in the walls of his house. They usually throw several swarms a year, so we hope to catch those. Bees are supposedly quite docile while swarming. We shall see. The drive home with them in the car will certainly be interesting. Leigh – Well, I am interested in the potential for wild swarms to be more resistant to Varroa mites and common diseases. The package bees you buy have been treated with chemicals and extensively fed to get them to that state. My nephew tried raising bees last year, and both hives died over the winter. He purchased two new packages this year, and has been feeding them for a couple months because of the bad weather. That’s almost $400 in bees! I don’t think success is really guaranteed either way, so I’m going with the wild swarm for the potential advantages and especially the cost (free). You do have a chance of getting some really mean bees by catching wild swarms. I’ve been reading about Warre and Top Bar Hives [TBH] too. There’s lots of interesting low-impact things going on in the beekeeping world, isn’t there? I also have the Barefoot Beekeeper book (for TBH), but I decided to go with the standard Langstroth equipment for now because it was faster than building a TBH for myself. Also, our local beekeeping association is very traditional, so I’d stand a better chance of getting some help by sticking with standard equipment. Finally, Langstroth requires less frequent interaction during the year, even if it is a little more intrusive on the bees. Since we rarely have time to get everything done, this was better suited to us. I might still build a TBH at some point. I think you’d learn more about hives by working with one. Ron – It’s certainly the great unknown for us too. I hope we at least get one swarm this year to work with.